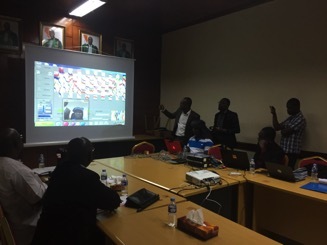 Our research team organized a functional Near Infrared Spectroscopy neuroimaging demonstration for the Ivorian Ministry of Education as well as a number of our Ivorian research partners. The neuroimaging demonstration events (at the University Felix Houphouet Boigny, hosted by the Neuroscience Laboratory, and at the Ministry of Education meeting) were a great success! Research is only possible with meaningful collaboration between all partners.